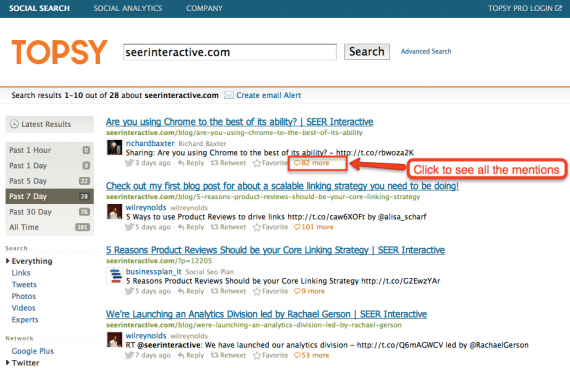 When you search for something on Topsy you will get a landing page like the following for SEERInteractive.com. This page is the dashboard of everything going on with the brand, url, or keyword that you entered. Filters – Using the filters allows you to find posts by a specific language, type of media shared, and when it was shared. When you are in the dashboard it will show you several different articles that have been shared. To see who has been sharing which article simply click on the “more” button. When you click on the more button you will see the data for that particular url. For example this screen shot is for the article Are You Using Chrome to the Best of its Ability? written by Nico Miceli . When you look at page exclusively for a particular url you will see the following important information. What I really like about Topsy is that you can look at the profile of the person that tweeted your url and then can reply, RT, or Favorite those tweets. Topsy also identifies influential people that shared your link. 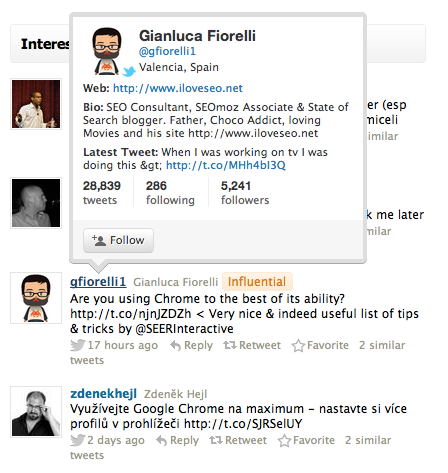 If I wanted to get more information on the person I can just hover over persons name like in the screenshot below for Gianluca Fiorelli profile who is definitely an influencer in the SEO community. I personally strive to respond to everyone that shares my link, but you can filter your share results to only see influencers that shared your link. There are 2 ways that I like to do this, the first is to type my brand or url into the Topsy Search and see how many posts have the most “more stories” next to them. Another way to do this is with the Topsy Analytics Tool. What you do is put your url in the 1st query box and then hit “look up” at the bottom of the page it will show you which links have gotten the most shares of all time and in the last 24 hours. This doesn’t work so well with smallers sites but can be great for larger sites that are getting several mentions a day. What Does My Brand Social Timeline Look Like? 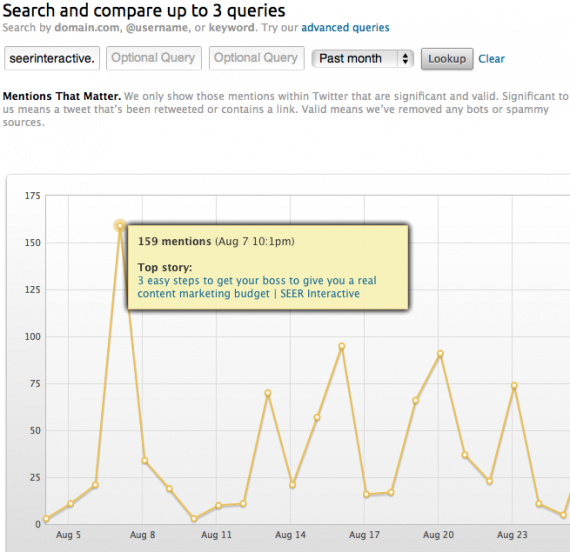 While you are using the Topsy Analytics Tool you can see what your social sharing timeline looks like. It will show you how many times you were mentioned and if you have a popular brand it will show you what the most popular story was on that day. How Do I Compare Socially To The Competition? I really like how this tool can be used to look at the competition to see what they are doing. For fun I compared myself to John Doherty and Rand Fishkin’s blogs. Rightfully so, mine is being crushed by the other two blogs. This is very helpful when checking out real rivals to see if they are getting shares and traffic from Twitter, and if so what is working. How Do Keywords Compare Socially? Are some keywords shared more than others? Do they have times that aren’t shared as much? You bet they do, just look at what happens when I compare Social Media, SEO, and PPC to one another. Looking at the screenshot below Social Media by far is mentioned the most, but also has a very predictable trend of when mentions drop off. PPC on the other hand is not mentioned as often but seems to be used more consistently. Researching and understanding how your industry keywords are being used can be used to your advantage to make sure you are getting the most exposure. Pro Tip: Look at the top stories for each day to find trends for your keywords. What Are The Top Trends In My Industry? Pro Tip: If you are looking to enter into a foreign market, look to see what words and slang are trending in that language. Now here is my favorite part about Topsy, are you ready? 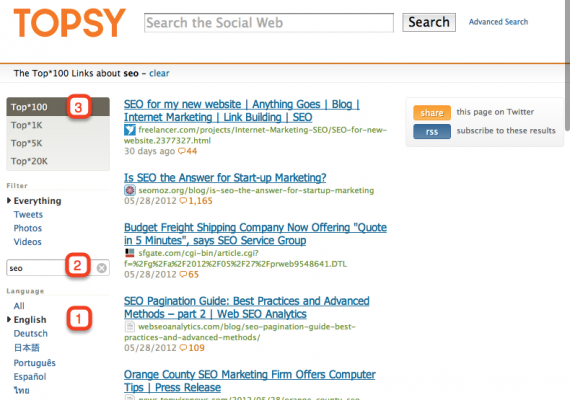 You can turn any Topsy Social Search into a RSS Feed or Topsy Alert! This means that you don’t have to constantly be checking back in with Topsy to see if your content is being shared. You can set up a Topsy Alert (just like a Google Alert) that will email you a summary of mentions as they arise. If you prefer to set it up as an RSS feed you can do that as well so you can monitor your Topsy feed along with other feeds in a social media dashboard like Hootsuite. Topsy is an incredible tool that has really helped me to better interact and monitor my personal brand on Twitter. I hope that these tips will help you to better leverage Twitter in your social strategies. If you have any questions or comments I look forward to hearing them. I also love to learn more tricks and tips from you. So if you have any please share them. thanks for this detailed review of Topsy. It seems pretty cool but it is limiting to twitter and google+. I imagine they will add more in the future perhaps. You might also want to check out Engagio which integrates with most of the social networks and focuses on the conversations in these networks. I am bit biased (since I worked for them:) but I think they are great service. Thanks for your comment, and for being so transparent about working for Engagio. I’ll have to check it out.